To forgive or not to forgive: that is NOT the question. Whether to forgive or not is akin to asking whether we should get a good night’s sleep or eat a balanced diet. We simply do not function optimally if we resist either; the latter benefiting our physical well-being, the former our psycho-spiritual well-being. “Oh, I’ve let that go. I’ve forgiven my best friend for betraying me. The Bible says we have to forgive but I can’t stand that @#*&#@!$^#.” And so goes the type of “forgiveness” I hear expressed so often; forgiveness born of obligation, not authenticity. Forgiveness confined to the head, void of the heart and soul. Authentic forgiveness occurs when one is liberated from the negative thought and feeling patterns inspired by the offending event. With true forgiveness the impulse to describe someone as @#*&#@!$^# ceases to exist. Forgetting is another story. We are meant to learn from history. Acts that require forgiveness are acts that bring wisdom for the journey ahead. Fool me once, shame on you; fool me twice, shame on me. Forgetting egregious acts committed against us only renders us fools as the lessons missed leave us vulnerable to repeated offenses. Most of us already know this…most of us. Many insist on forgetting, too often out of distorted teachings associated with forgiveness. Fortunately these distortions are being corrected. Unfortunately what remains is the directive to forgive without much instruction on how to forgive. Forgiveness is an emotional, cognitive and behavioral process that is ultimately a matter of realignment. The opposite of forgiveness is resentment. For there to be resentment, some actual or perceived wound has been inflicted by another, resulting in a feeling of vulnerability and fear. Fear fuels the resentment which is essentially anger. Anger/resentment is a defensive stance that seeks to protect against future hurt. Forgiveness occurs once the sense of power and control lost through the offending incident is reclaimed. Forgiveness requires the processing of emotions associated with the offending event – hurt, sadness, anger and especially fear. Dealing with fear involves exploring the risks associated with forgiveness. The following questions are useful in understanding the nature of resistance to forgiving and constitute much of the process that moves us toward forgiveness. What might happen if I forgive? What might I have to give up to forgive (i.e. sense of being right, sympathy for being a victim, etc)? What might I have to do differently? What will happen if I don’t forgive? What are the payoffs for holding on to the resentment? What are the costs of holding on to the resentment? To forgive one must come to accept that maintaining the resentment is only hurting oneself. What happened cannot be controlled or changed, only how we choose to think about it. If we have discharged feelings about the event numerous times and nothing has changed, the problem is our thought process. Continuing to think about the event the same way produces the same negative feelings because the wound is continuously re-experienced. Essentially you continuously wound yourself long after the person is gone and the circumstance has ended. Whereas forgiveness of others requires dealing with anger, sadness, and fear; forgiving oneself often requires attending to the added burdens of shame and guilt. 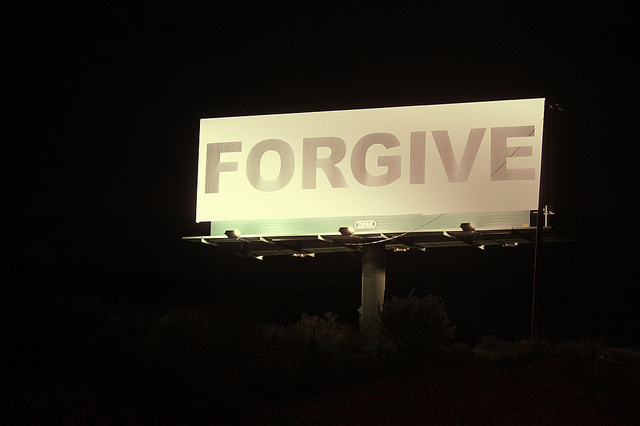 For those reasons forgiving oneself can be a more arduous task than forgiving others. Many of the aforementioned questions related to forgiveness are usefully applied when bound by shame and guilt. Ultimately forgiveness is the reclaiming of aspects of self (i.e. sense of power and control) lost during the wounding experience. Once we are realigned with our inner strength, grounded and have reestablished our sense of security, we gain reprieve from the emotional hold of the past and are able to move beyond the fear-based stance of resentment. This entry was posted in Psychology, Spirituality and tagged Anger, Emotion, Forgiveness, Power, Relationships, Resentment. Bookmark the permalink.